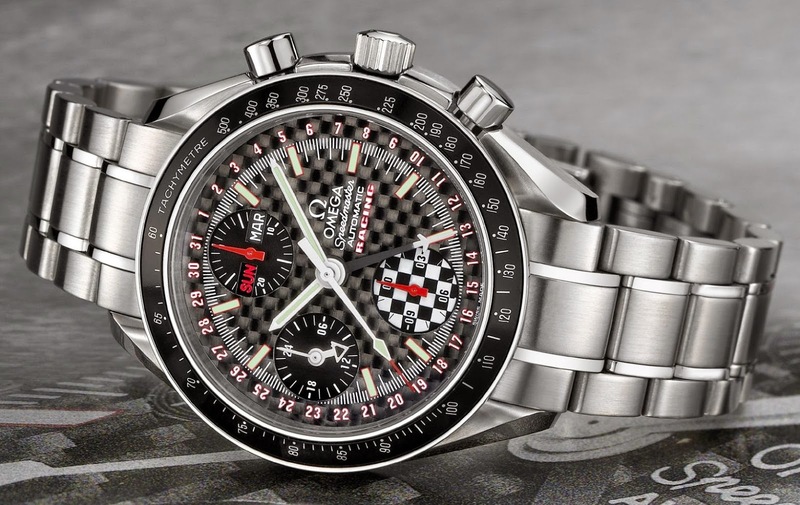 Launched in 2003, the Limited Edition Speedmaster Day-Date Racing model celebrates Michael Schumacher’s historic fifth world championship driver’s title in the Formula 1 race. Michael Schumacher entered the Formula 1 history books in 2002 by equalling Juan Manuel Fangio’s record of 5 Formula 1 World Championship titles, which was established back in the 1950s. 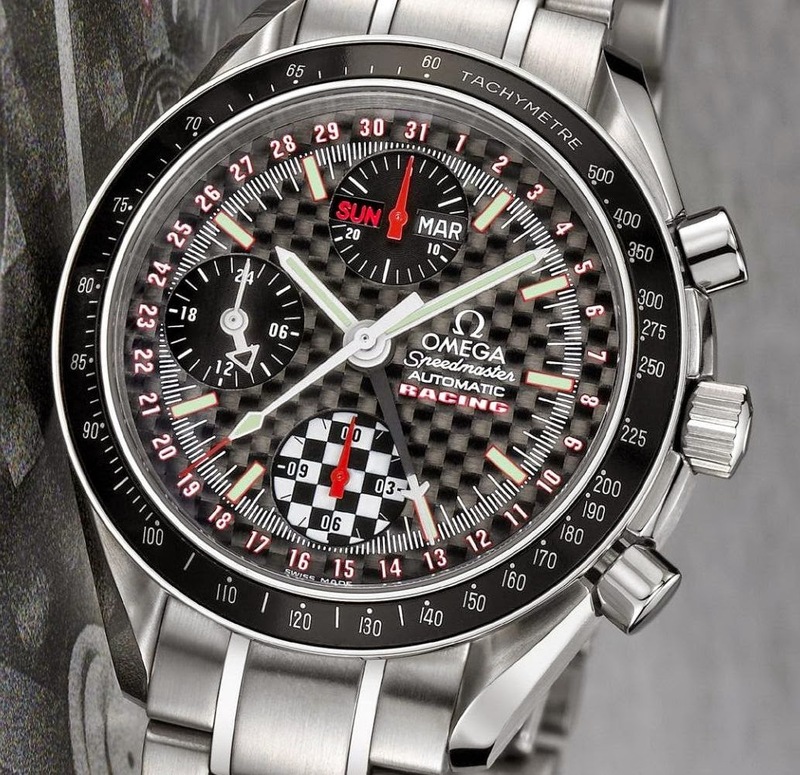 The 2003 limited-edition OMEGA Speedmaster Day-Date Racing is, however, linked with motorsport by more than just its name and OMEGA’s ambassador Michael Schumacher. Its design traits clearly place it in the context of Formula 1 and thus offer the perfect collector’s piece for fans of this sport. The dial is made of high-tech carbon fibre, for example, which gives an immediate indication of the watch’s special character. Another unique touch is the red outlining used for the RACING inscription, hour markers and dates on the dial. The ultimate limited-edition cachet is conferred by the special case back, which bears the inscription “WORLD CHAMPION 2002” in red and Michael Schumacher’s signature in black. The same proven OMEGA calibre 1151 found in the standard Day-Date models is used in this limited-edition model, with day, month, date, hour, minute and continuous seconds display. The self-winding movement, which has a power reserve of 44 hours, also has a chronograph function displaying elapsed times to within ¼ of a second using the central chronograph hand. Even the chronograph sub-dials at 12 o’clock (minutes) and 6 o’clock (hours) have an unmistakable F1 touch – the former incorporates the day and month displays with the Formula 1 race day, Sunday, highlighted in red, whilst the latter has a chequered flag background. The sub-dial at 9 o’clock comprises an additional arrowhead 24 hour hand (GMT) in addition to the usual continuous seconds hand. A separate central arrowhead hand points to the date on the 1 – 31 scale around the circumference of the dial. The tachometric scale on the bezel allows the calculation of speeds from 60 to 500 km/h based on a 1000m reference distance. Equally important standard features of every Speedmaster are the water resistance guaranteed to a depth of 30 metres and the scratch-resistant sapphire crystal with interior anti-reflective treatment that protects the distinctive look of the resolutely sporty dial. Production of this model, which is available exclusively with the stainless steel Speedmaster bracelet, was limited to 5,555 numbered units.